A lively half hour of bass, hip-hop, and carnival sounds from BBC Radio 1Xtra’s finest. When she's not lighting up the airwaves of BBC Radio 1Xtra with the U.K.'s brightest new music, DJ and tastemaker Jamz Supernova runs the monthly London club night Future Bounce. Both on the radio and on the dancefloor, her selections appeal to the heads and the feet at once. At Future Bounce, you'll find club and bass tracks from the freshest new producers, stretching your imagination as well as making you sweat. 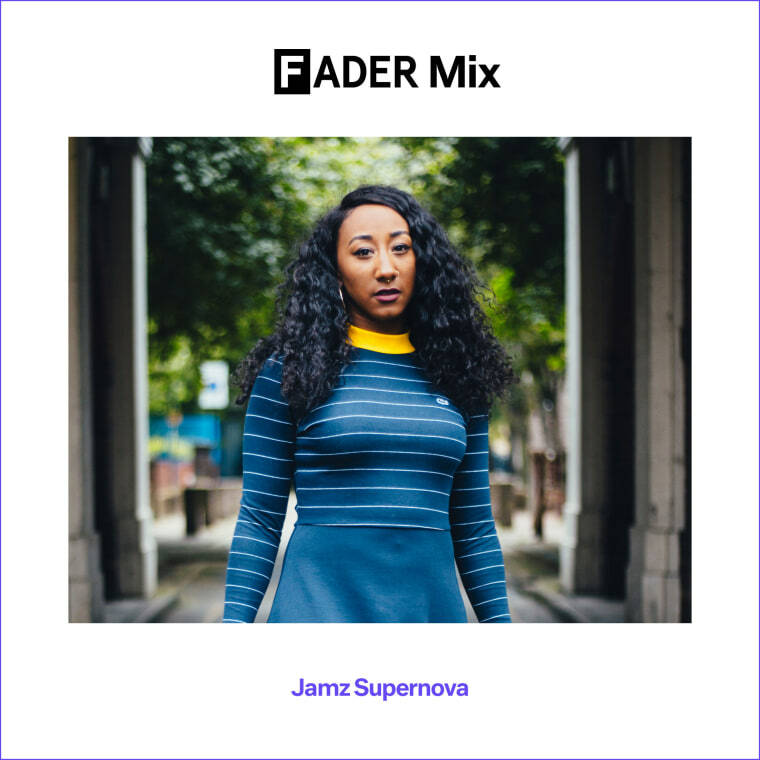 Ahead of her next event on October 7, Jamz put together a FADER Mix that you won't be able to sit still to, including fiery edits of Beyoncé and Sampha. Listen below, and read on for more on her thoughts on London club culture in 2016 and her love of Shonda Rhimes. Right now I'm at home in south east London, sitting in my living room at my makeshift desk/studio with all my equipment around me: laptop, CDJs, speakers, and keyboard. The mix is a melting pot of all the sounds I love to play out when I'm DJing: R&B vocals layered over bass and carnival sounds. I'd love to imagine people getting ready to it before they head out for the night. What was your highlight of summer 2016? This has been my busiest summer to date, and it's been so much fun. My highlight would have to be Glastonbury, getting to not only play there but have my set go out live on Radio 1 and 1Xtra. I went B2B with Amy Becker, and at the time we were super-focused and just cracked on, but looking back, it's a pretty big deal as a new DJ. Running a club night right now in London seems harder than ever, with spaces closing down at an alarming rate. What's your advice for people thinking of getting into nightlife/running their own night? It is such a shame that iconic London spaces such as Fabric are closing down, but don't let it deter you from setting up. We have to keep the club culture in London going. I would say, find a cool club that represents your brand in a thriving location. And start small — even if it's just 100 of your mates to begin with. Also make sure every angle of your promotion is covered. How would you describe a Future Bounce night to someone who hasn't been? I'd describe the night as fun discovery; if you're looking to unearth your new favorite DJ or rave to sounds that make you want to Shazam every record, it's a night for you. It's definitely for music heads, but it's fun and welcoming and we're not snobby. Our lineups have become a breeding ground for new talent, and they're often DJs who haven't played in London before, or rarely do. In the past we have had salute, SH?M, Gravez, and our next one on October 7 is with Ozzie and Wize. The last book I read was Shonda Rhimes's The Year Of Yes. I'm a sucker for a self-help book or autobiography. The book made me chuckle, and if you've watched any of her show Scandal or How To Get Away with Murder you'll love it. But it had an impact, because it's a constant reminder not to overthink everything and to go with the flow. I must confess I don't cook often, but I do love to make a cheeky prawn stir fry, simple and easy. Throw it all in the wok, with some Sriracha sauce, and boom! Jarreau Vandal, "Hot Sauce In my Bag Swag"
Hagan X Missy, "Marimba Club"
Wallwork & Nico Lindsay, "Fyah"
Get tickets for Jamz Supernova's Future Bounce residency here, and catch her on BBC Radio 1xtra at 10 p.m. on Tuesdays, 1 p.m. on Saturdays and Sundays.